Imagine this 20' tall salesman standing on the roof of your store, or in front of your car dealership. He doesn't eat much, just a little electricity, he doesn't complain, and he never asks for a raise. 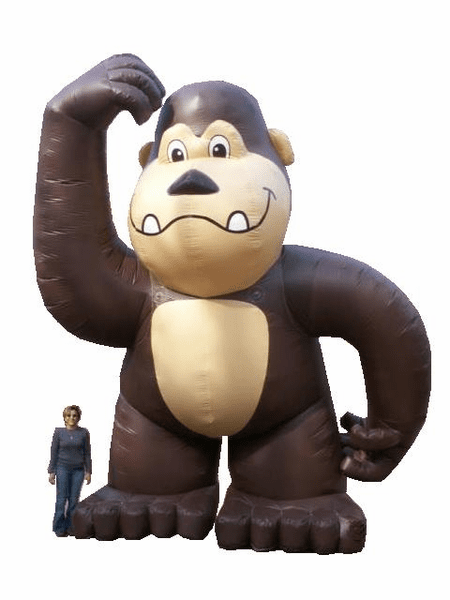 Drive buisness to your store by drawing maximum attention to drive by traffic with this giant inflatable gorilla. Made of high quality 7.5 oz. coated nylon. The entire inflatable is completely double stitched with extra heavy 207 thread for long life. Four anchor points on the front and four on the back with anchor points on his feet for easy installation. The inflatable was made in the USA and ships out of Atlanta, Georgia. We are a custom manufacturer of high quality outdoor giant advertising inflatables. We can custom make any inflatable to resemble any character or logo. We have very fast turn around time because we are the manufacturer and do not outsource or resell. We sell air blown dancing tubes and guys as well as giant rooftop, hot air shaped balloons. We custom make banners for these balloons. We make giant gorillas and any character. We also repair any inflatable including inflatable jumpers, slides and obstacle courses. www.inflateonline.com covers USA, Canada, Puerto Rico, Chicago, Atlanta and Houston : - custom inflatable ad blowup.